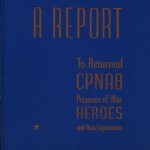 Anyone connected to the Wake Island civilian contractors’ story either has or wants to have a copy of the “Blue Book,” officially titled A Report to Returned CPNAB Prisoner of War Heroes and their Dependents. The slim volume recounts measures taken to extend wartime relief to dependents and the passage of several public laws during the war to ensure compensation for the captured employees from Wake, Guam, and Cavite, and their families. The enduring appeal of the book, however, is in the nearly eight hundred prewar photographs of the missing men. The Blue Book photograph section contains about 64 percent of the American contractors killed or captured Wake Island in WWII: 734 of 1,145 men. (There are actually 739 Wake photographs, but five are duplicates.) In addition, there are 38 photographs of the 71 Guam contractors and 20 of the 37 Cavite employees (see my recent post on Guam and Cavite). The thumbnail-sized pictures, each bearing a handwritten number in a lower corner, are crowded on eighteen pages along with numbered lists of the names and hometowns of the men. Many are formal headshots, but some are cropped from casual outdoor snapshots. My father, Ted Olson (p. 35, number 46), is in suit and tie in his high school graduation photograph. Row after row, the photos show boyish grins and peach fuzz, receding hairlines and wrinkles, rakishly-tilted hats, a few Hawaiian leis, and quite a few pre-WWII service uniforms and caps. Some of these men survived the war; some did not. The Pacific Island Employees Foundation, Inc., of Boise, Idaho, compiled the book in 1945, to give to the returning POWs and their families. Harry Morrison, president of Morrison-Knudsen Company (the primary sponsor of the Wake project), created the PIEF in 1942 as a charitable foundation funded by the CPNAB Executive Committee. The PIEF was first tasked with aiding the dependent families of the missing workers, whose navy-contract salaries had abruptly ceased with their capture. The charity augmented the woefully insignificant Social Security payments to needy families and addressed special-needs situations, and soon began issuing monthly newsletters as information emerged on the status and location of the missing men. In the coming years Congress passed wartime legislation to compensate the captured contractors and provide allotments – or death benefits where necessary – for their families, decreasing the need for charitable funds. The Blue Book contains an analysis of PIEF donations by purpose, number, and amount, accounting for nearly 5,000 disbursements totaling $94,611.96 by September 1945. Particularly poignant is the entry for 908 “Christmas Checks for Minor Children, 1942, 1943, and 1944.” The PIEF newsletters continued through the war, providing much-needed POW information, and many family collections, including mine, still hold yellowed copies of those pages. To obtain these photographs, letters are being sent to known relatives of the PNAB prisoners – mailed in alphabetical order at the rate of a few-score each month so the pictures can be published without holding them too long before returning them. The avalanche of photos . . . has required more space than anticipated and reduced proportionately the room for descriptive text. These ten photo groups were incorporated into the Blue Book in their sequential order with original numbering, which explains the puzzling organization. Several hundred families either missed the request for photographs or had none to send, which explains the incomplete gallery. An alphabetical index in the back of the Blue Book allows for a search by page number, though there are numerous spelling errors and several omissions in the index. The Blue Book’s lists of CPNAB casualties and POW deaths were admittedly incomplete as they were compiled before the end of the war and in some cases lacked official confirmation. Sadly, those lists would grow. Most of those in the Blue Book’s long list of missing and unreported men would have to be added to the dead, including the ninety-eight massacred on Wake Island, a war crime as yet unknown to the outside world. Like the photographs themselves, the Blue Book is a snapshot in time. Seventy years after its 1945 publication I have dissected it for errors and omissions, entered photo pages and numbers in roster spreadsheets, and created digital files of the photographs. But sometimes I just leaf through the book itself, thinking about my just-liberated father holding it in his hands for the first time, searching for the faces of his friends and maybe staring at his own photo, trying to recognize the fellow he used to be. View the full “Blue Book” here.